Atlanta: Soft-drinks maker Coca-Cola Co. seeks to double its business in the next decade as it caters to the expected billion people worldwide who will join the middle class by 2020. The world’s largest soft-drink maker told analysts and investors at a meeting on Monday that its system-wide revenue will reach $200 billion (Rs9.26 trillion) by 2020. The firm hopes to make more money off those sales as it sells more soft drinks in emerging markets and reduces costs. The company hopes global growth can make up for weak US sales, which have been slipping as consumers limit their spending in recession and switch to juices and teas. Kent said the company must pay attention and react to changes in the world, which it didn’t do from 2000 to 2004. “We were too busy looking at the dashboard in front of us and not sufficiently paying attention to the world outside our windshield," he said. The company believes that the world will be a different place in the next decade, with more consumers in the middle class and more living in urban areas. Coca-Cola said people—many of them young consumers the company will target—will also want their brands to show that they have values, such as being environmentally responsible. “Consumers now value and are defining themselves more and more by their identity, their values and their beliefs, and they are insisting that companies do the same," said chief marketing and commercial officer Joe Tripodi. For example, the company plans to highlight its environmental efforts, he said, such as the PlantBottle. On Monday, the company said it is using the new bottle, which is partially made out of plants, in some markets such as Denmark and western US. Coca-Cola plans to have two billion of the bottles in production by the end of next year. Coca-Cola plans to focus on its namesake brand, which Kent calls the “oxygen" of the company. Key markets such as China and Russia have low consumption rates, meaning there will be room for Coca-Cola to grow. But it also plans to have more big brands. It currently has around a dozen brands worth $1 billion each, such as Coke Zero and Fanta, which both grew to that size in the last decade. In the next decade, Coca-Cola expects to have 30 brands worth that much as it sells more of its brands to the rising middle class around the world. The company said because it operates in at least 200 countries, it will be better able to grow in these new markets while still keeping its costs down. It eyes annual savings of $500 million from general and administrative costs by 2011. Coca-Cola’s comments come as the company faces a rapidly changing industry, as its main rival—PepsiCo Inc.—buys up its two largest bottlers. PepsiCo announced the $7.8 billion deal to buy Coke’s bottlers over the summer, saying the move will allow it to react more quickly to changing consumer tastes by being faster to market with new products because it will control distribution. The move can also help PepsiCo save on costs. But Kent said Coca-Cola remains committed to its franchise system, which sells concentrate to bottlers who make and distribute Coca-Cola products, rather than the firm selling them itself. Kent said the system allows the firm to focus on its brands while also giving it the benefits of scale. 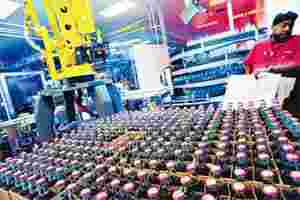 The company will be able to keep growing if the emerging markets it’s targeting do keep growing and people have more disposable income, said John Sicher, editor of trade publication Beverage Digest. “As consumers get wealthier, Coke becomes more and more affordable and the growth becomes more achievable," he said.